Printrbot Simple – *Beta* Launch #3dthursday « Adafruit Industries – Makers, hackers, artists, designers and engineers! Check out the launch of Printrbot Simple, a new even lower-cost Printrbot printer that debuted to beta price of $249 (and promptly sold out). While there are some printer companies that cut corners at the outset to deliver “introductory” 3D printers aimed at the casual consumer — leading to rather dismal, frustrating first print experiences and RMAs — Printrbot finds its way to affordable by the route of chiseling away at the parts count to deliver printers that while not expensive, are still well-though out 3D printers. Head over to Printrbot to meet their latest bot! 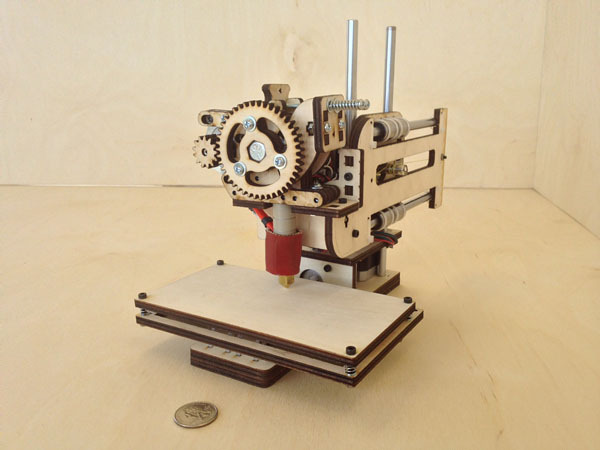 The Printrbot Simple is an exercise in 3d printing minimalism. It includes only what is needed to get started in the world of 3D printing. At $299, we think you will agree that it is both tiny…and a really big deal. FYI. I just bought one, so I don’t think they are sold out yet. Site claims you can order up until 7:00 pm PST tonight, May 2. Note: beta and they want you to blog/post what you print. Same here. I just bought one. Any tips for 3d printing newbies? I bought PLA, 1.75mm spool… it looks like that what I will need. Thanks folks! I couldn’t resist leaving a few in stock for the die hard late-comers 🙂 Sort of a little easter egg for a few lucky folk. I bought one too! I’m excited to see how the printer performs. Worst case, if it breaks prematurely, I can always use the electronics/motors/etc. to upgrade my decrepit Cupcake CNC.